How can I remove a social profile? I've changed the password on my Instagram account, what should I do? How can I swap my legacy plan to a different handle, or swap my plan to a different account? My Instagram account has been hacked or suspended, what can I do? I subscribed on the former version of Iconosquare. Will my Instagram data history be available on the new version? How can I delete my Iconosquare account? 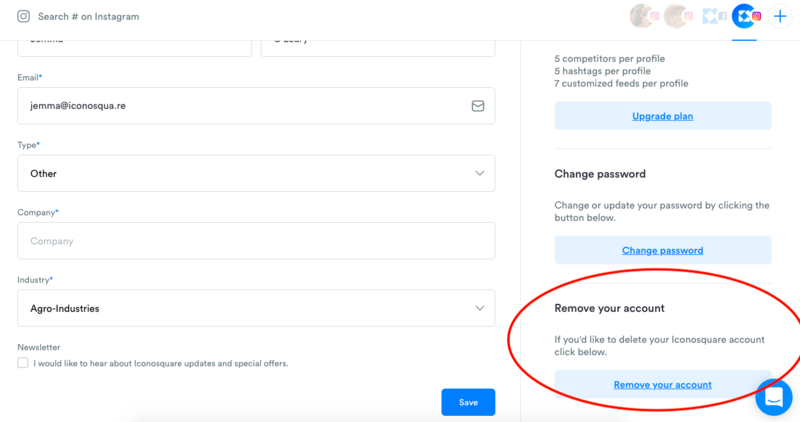 This article explains how to delete your Iconosquare account - NOTE: This does not cancel your subscription. Click 'Settings' and you'll be taken to your 'Profile' settings. Please note that deleting your Iconosquare account doesn't cancel your subscription. To cancel your subscription, click here. How can I turn off the auto-renewal on my plan?